Many craft beer lovers, myself included, are drawn to the new. I cannot remember the last time I ordered the same thing twice at a bar on the same night, for example. I am constantly trying out the latest collaboration and relishing in some obscure style made by a brewery whose name I can’t even pronounce. So it’s a novelty, in a way, that I have a beer I frankly don’t ever see myself not having in my fridge. The plainly named Porter from Back East Brewing of Bloomfield, Conn., is nothing flashy. By American standards, it’s probably a little mild. By British standards, it’s maybe a bit too hoppy. But chemically, psychologically, and spiritually, it fits me like a glove. I’m not a shill for Back East — I like their co-owners and enjoy some of their other beers — but really, the Porter is the only one I’m crazy about. Luckily for me, it’s a year-round offering. I could see a brewery putting these out only in the wintertime, and so it’s a delight that I can find those silver cans waiting for me pretty much whenever I’m in the mood for them. 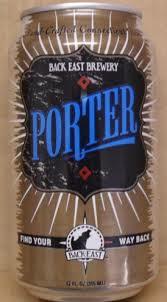 The Porter has hints of burnt coffee and dark chocolate, but those are subtle. There’s a tiny glimmer of bitterness in the finish, but nothing that lingers. I’ve had it with sharp cheese, chocolate cake, gingerbread, hamburgers, and Girl Scout cookies of all kinds. I just felt it necessary to share with you that while I hunt down whatever’s the flavor of the minute (which usually means some double IPA that’ll leave you swimming in Citra hops), there’s still a go-to beer that in case you’re wondering, you can offer me any time and I’ll grab gratefully. This entry was posted in Beer Snob and tagged Back East Brewing, porters. Bookmark the permalink. Have you been to Broad Brook Brewery in East Windsor, CT yet? Highly recommend! !